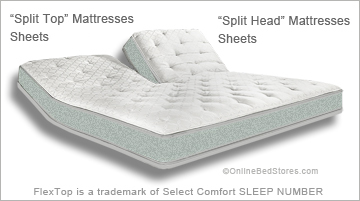 Split Head Sheets or Split Top, Select Comfort Flex Top Mattress Sheets or Comfortaire U15 Box-Top Mattress Sheets. Looking for those hard to find sheets that will fit your new split head queen, split head king or split head cal king mattress? OBS has made it easy to find the right sheets. Keep in mind that a “split head” or “split top mattress” should never be confused with a “split mattress”, split head or split top mattresses are ONLY split at the top or head of the mattress between 34″ and 35″ inches down from the top. 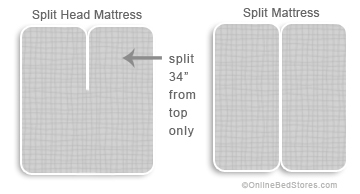 Split mattresses are two completely separate mattresses pushed together, for example a split queen, split king or split cal king are all comprised of two separate mattress, now that you clearly understand the difference between the “split mattress” vs “split head mattress” you are ready to shop, look for sheets listed as split head or split top sheets only. 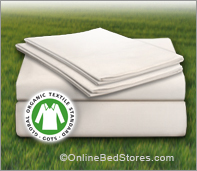 Split Head Sheet Sets or Fitted Sheet Only, Patented Straps.